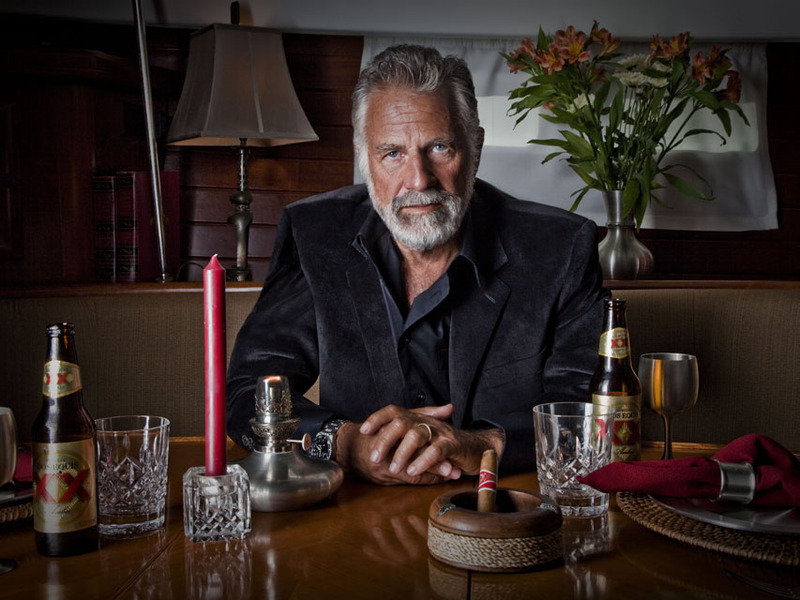 It’s hard not to be intrigued by Jonathan Goldsmith, who stars as Dos Equis’ The Most Interesting Man in the World. Like many who enjoy the campaign, I was curious to know more about the man behind the myth and whether he actually lives up to the moniker. I also wanted to find out what he drinks when he’s not drinking Dos Equis. When we sat down for our conversation on a recent afternoon, Goldsmith was puffing on a cigar and offered me one. I accepted. We bit off the ends, lit up. He started talking. Goldsmith lives in Manchester, Vermont, on four and a half acres, heats his house with wood in the winter while drinking single-malt scotch, and has an old fishing boat, which he puts to use in the spring and summer (beer in tow) on Lake Bomoseen and along the Battenkill River in upstate New York. He is passionate about working for charity and spends a good deal of time meeting with the most powerful people in the world. In fact, it was Goldsmith who was the “surprise” guest in addition to about ten of Obama’s best friends. I ask if he and the President drank beers together. Like, maybe a Dos Equis. “Yes, take a look,” he said, showing me a picture to prove it. “Did you play beer pong with the President?” I asked. “Of course, I would have won,” he said. Goldsmith has no political agenda it turns out, but he enjoys using his celebrity status to give back, getting involved behind the scenes with such issues as GMO labeling and hunger relief with organizations like Hunger in Vermont. He’s even worked with a non-profit called The Mine’s Advisory Group, which removes land mines and unexploded ordinances left over in war-torn areas of the world. He’s creating a legacy for himself, and that got me thinking about wine because that’s what most wine producers claim they hope to leave—a legacy of some sort. I asked Goldsmith if he drinks it. “I love wine,” he said to my delight. “Yes, I do. In fact, we call it a basement,” he replied. Goldsmith likes Napa Valley cabernet and wines from Central Coast California and Chile. A man after my own wine obsessions! “Are you a spirits drinker?” I asked. “No, just under my arms,” he said. As our cigars began to burn down, we also talked about Dean Martin’s fabricated Olympic Drinking Team, Goldsmith’s obsession with political biographies and spy novels, and his meditating routine. Goldsmith, who at times really seems as though he is the most interesting man in the world, even told me a story about saving the life of a hiker. Climbing Mount Whitney with an ex-marine named Larry, he encountered a young man coming down the mountain with just a t-shirt and denim jacket. Goldsmith made a mental note of how ill-equipped the fellow was and, after a short while of continued hiking, a whiteout struck. Goldsmith’s first thought was that he and Larry needed to head back down and find “the jerk.” They hobbled down and, sure enough, found him in a delirious state. They put socks around his hands and a poncho on him, then stuffed him into Goldsmith’s sleeping bag. The storm broke by morning and, because of their help, the guy was alive. I asked if he had some barrel-aged Dos Equis tied around a saint bernard up on there on the mountain. “No, I gave him the day off,” he replied. “How about a toast?” I ask. “Celebrate the possibilities,” says Goldsmith. Previous articleAsk Chris: If Someone Gets on the Bus Without Paying, Is There a “No Fare” Button the Driver Can Hit?